The headphone fader controls the level of the returning IN signal from the station going to the headphones. Range -20dB to +20dB one step per dB. 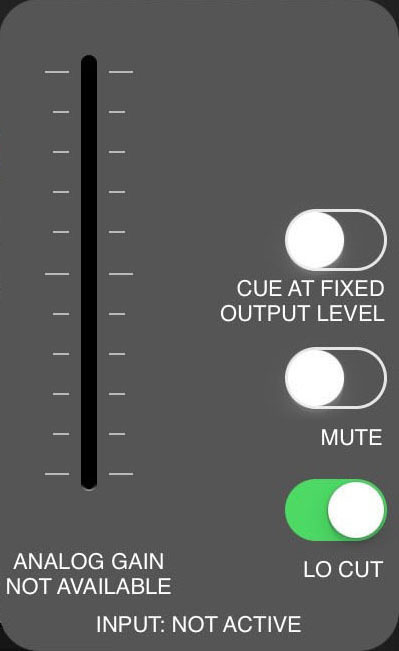 The headphone can be muted by tapping the headphone icon at the bottom of the fader. The microphone fader controls the level of your streaming OUT signal going to the studio. Range -20dB to +20dB one step per dB. Check the OUT-peak level meter if you need to adjust the level of the out-going signal to the station. In order to hear yourself back through your headphone, you can cue your mic signal by tapping the microphone icon at the bottom of the fader. NOTE: The Mic level fader is a digital gain. The slider controls the gain after the Microphone pre-amplifier and A/D converter. Consequence: if applying a gain below 0dB (attenuate) the resulting level will not reach 0dB anymore. So for example, if the gain is set to -7 dB, the maximum Mic level will also be -7dB. Use attenuation only when you temporarily need to lower the Mic level. When you apply a gain above 0dB LUCI LIVE will use a limiter to make sure the input is not overloaded. So, in short, first make sure that the audio input can not be overloaded and then use the Mic slider to amplify the signal to your desired level. This way you do not need to worry about over-modulation/distortion. ‘CUE AT FIXED OUTPUT LEVEL’ will set the cue output level to -17 dB independent of the headphone fader. ‘MUTE’ will mute the microphone. ‘LO CUT’ will activate a special filter to filter out low frequency ‘plop’ sounds. ‘ANALOG GAIN’ here you can set the gain of the Microphone preamplifier. Note: only available on devices that support this and when the Microphone is switched On.